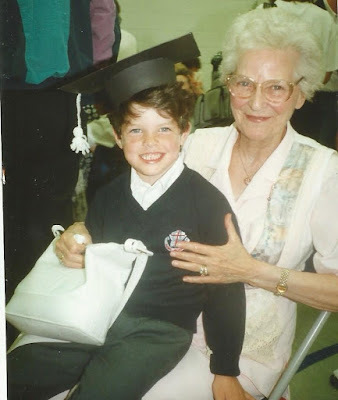 Here I am with my late grandmother at my kindergarten graduation. She was one of my biggest supporters for my musical accomplishments. I knew from a young age that I was different, but wasn't able to understand what that meant. I was raised in a literalist, fundamentalist, Christian family that has never accepted an "alternative lifestyle" outside of Christianity. So you can only imagine what growing up in a family that refers to homosexuals as ‘fags’ or ‘poofters’ was like. I always wanted to be close with a guy, to feel a special bond between the two of us. I guess you could also say I'm not society’s portrayal of the stereotypical masculine man. I do not like movies with huge explosions, aliens, and guns. I like musicals, chick flicks, rom-coms, and movies that actually have a storyline. I listen to Elton John, Barbra Streisand, and Whitney Houston almost daily. I remember going through a huge Celine Dion phase in middle school and singing "The Power of Love" at the top of my lungs at home. My family did not like the fact that I would sing "...And you are my man!" with such conviction. At age 19 I came out to my friends and co-workers who were very supportive. But when my family found out about my “sinful lifestyle" in 2013, it was off to Bible school for me and borderline reparative therapy. I have had deliverance performed on me, been sent to Exodus International, told to act more manly, and that if I just think I'm straight that I will be straight. Of course, none of that worked. My parents also demanded that I break up with my boyfriend so they could send me to more reparative, conversion therapy. After a month of refusing, I was thrown out of the house. I was blamed for "bringing demons into the house," and my family said they would never come visit me at my new place because they “cannot walk on unholy ground.” That was two years ago and I have not seen my family since. The good news is I am still with my boyfriend and we’ve been together for three years. We could not be happier together and will be traveling to Europe soon. I plan to marry my boyfriend one day and start a family with him. I have not seen my family since they threw me out, nor do I think I will be seeing them any time soon. People tell me to not lose hope, but I have to face the reality of a future without them. My friends have become my family and I have never felt so loved and accepted in my entire life. While my situation is not ideal, I wouldn’t trade places with anyone.